Fairport will be headlining on Saturday night. The new century found Fairport in fine form. Concert halls were full and records were selling well. The year 2000 was marked by the very successful ‘Y2K’ tour and a new studio album, The Wood And The Wire. Fairport Convention won the coveted Lifetime Achievement Award at the 2002 BBC Radio 2 Folk Awards. The seminal album Liege And Lief was voted ‘Best Folk Album Ever’ by Radio 2 listeners. In Summer 2006, Liege And Lief was awarded a Gold Disc for its continuing sales. Fairport Convention is still one of the busiest bands around. The current line-up of Simon Nicol (lead vocal, rhythm and electric guitars), Dave Pegg (backing vocals, bass guitar, mandolin), Ric Sanders (violin), Chris Leslie (lead vocal, fiddle, bouzouki, banjo, mandolin and woodwind) and Gerry Conway (percussion and drums) still packs venues on its frequent tours. 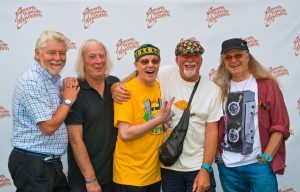 This year the band release their new live recording from their 50th anniversary concert at 2018’s Cropredy Festival “What We Did On Our Saturday” featuring the current line up, plus former Fairporters Richard Thompson, Ashley Hutchings, Judy Dyble, Dave Mattacks, Iain Matthews and Maartin Allcock, ably assisted by their friends Ralph McTell, Sally Barker, Chris While and PJ Wright. Each year starts with Fairport covering the length and breadth of Britain on its Winter Tour (Wintour). This is folowed by a more relaxed Spring tour and in August, the band stages Fairport’s Cropredy Convention music festival in Oxfordshire. Each December the band’s time is occupied by side-projects and their respective Christmas tours. Simon tours with The Albion Christmas Band; Peggy with both The Dylan Project and Anthony John Clarke; Ric with the Ric Sanders Trio; Chris with St Agnes Fountain and Gerry with both Fotheringay and The Dylan Project.